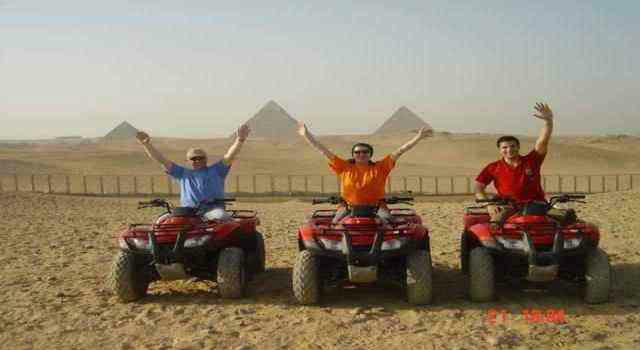 Our guide will pick you up from Port Said then drive with comfort AC modern van to Cairo to experience the wonders of ancient world at the top of 4 wheels dune buggy. Admire the panoramic view of Giza Pyramids of Cheops, Chephren & Mykerinus then explore the Great Sphinx with pharaoh head and lion body, continue to the Valley Temple related to king Chephren Pyramid complex. Drive to Saqqarra then relish short jeep safari deep in the desert, stop to wander the panoramic view of Saqqara Step Pyramid of king Zoser, it is believed to be the first stone structure in history then enjoy short camel back ride takes you to Sakkarra Country club to get the previously served lunch buffet meal and finally you will drive back to Port Said.